We introduce a new approach to diffusion-source estimation for quick identification of the unknown source, based on Taylor’s diffusion theory for turbulent transport of passive scalar from a fixed point source. In order to evaluate the method, we used planar laser-induced fluorescence to measure the concentration field of fluorescent dye in water flowing in a channel. We considered two kinds of datasets: basis data and observed data. The former is used to determine the basis functions characterizing the streamwise dependence of variances for three statistics: the mean concentration, root-mean-square (RMS) of fluctuations in the concentration, and RMS of the temporal gradient of the fluctuating concentration. Consistent with Taylor’s theory, we found that the lateral distribution of each statistic was basically Gaussian, and their standard deviations increased as a function of the square root of the distance from the emitted point. Based on these facts, a basis function can be formulated and expected to be valid for estimation of unknown sources. Source estimation was performed with the observed data, which corresponded to limited available information about the concentration from an unknown point source. We confirmed a good prediction accuracy of the proposed method with an averaged bias as small as the turbulent integral scale. Better precision was achieved by employing several statistics simultaneously. In this case, the standard deviation of the estimated source position was assessed at 14 % of the mean distance between the source and measurement points, after 100 source-estimate trials with different datasets. 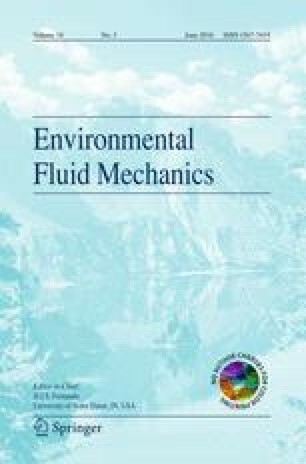 The methodology tested in this paper is expected to be applicable more general and complex environmental diffusion issues involving anisotropic turbulent dispersion, and space–time variable mainstream systems; but its versatility in such systems is currently under investigation. We express our appreciation to Messrs. Shotaro Hatsutani and Junichiro Hasegawa, who were master’s students at Tokyo University of Science, for their support in experiments and discussions.